I used to eat oatmeal for breakfast nearly every single morning during college, but I can assure you it never tasted nearly as good as this. The school I attended is very small (fewer than 2k students), so everyone lived in dorms on campus all four years, which meant four looooong years of dining hall food. During those days, I was also running up to 65 miles a week for cross country/track, so my daily oatmeal was a much-needed source of carbs! 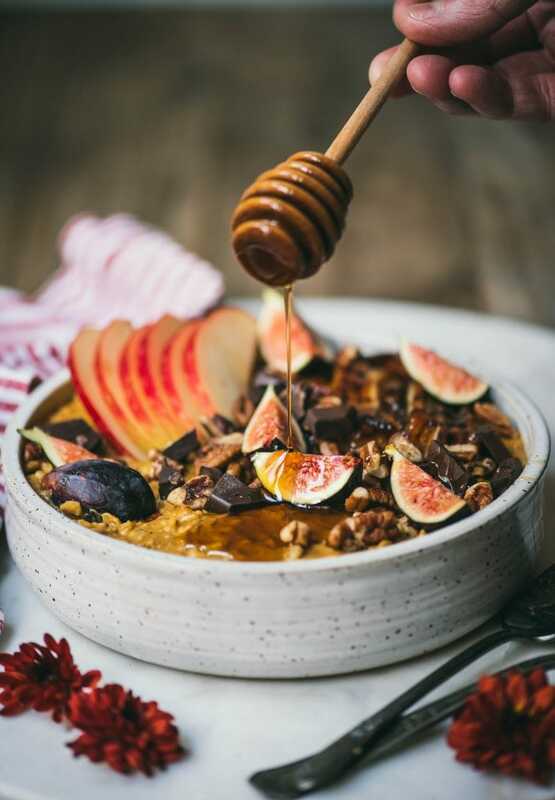 Nowadays, I only eat oatmeal if it’s really flavorful (my taste buds eventually became sick of my repetitive breakfast), and loaded with toppings, which preferably include caramelized bananas and melty dark chocolate. If you’ve never caramelized bananas, you are truly missing out. For whatever reason, I can’t stomach a plain banana unless it’s in something else (a smoothie, etc), but I could probably scarf down about 5 caramelized bananas in one sitting. 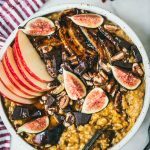 We use maple syrup to encourage caramelization, which pairs perfectly with the fall flavors of this oatmeal. 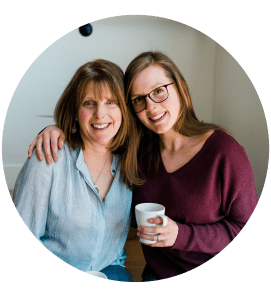 Pair this with a steaming hot mug of coffee, and you’re well on your way to an ideal fall morning! 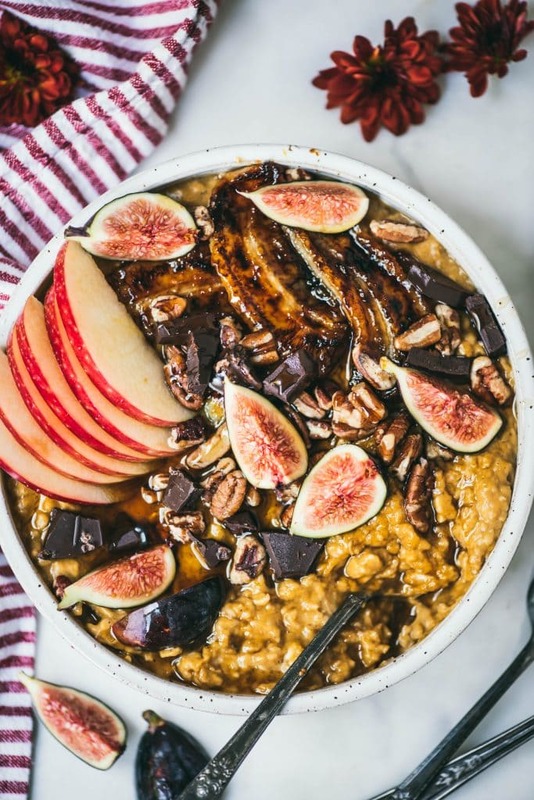 Creamy peanut butter pumpkin oats topped with caramelized banana, chocolate and fresh figs…what more could you want in a breakfast? Cook oats in nut milk according to package instructions. Stir in pumpkin, peanut butter, maple syrup, vanilla, cinnamon, nutmeg and salt. Meanwhile, heat a skillet to medium-high heat. Add coconut oil, slightly reduce heat, then add banana slices. Pour in maple syrup and toss to coat. Let cook 2 mins on each side, or until lightly browned and caramelized. Remove from heat and transfer to bowl of oatmeal. If desired, top with chopped nuts (pecans), dark chocolate, figs and/or other fruit of your choice. Enjoy! Try not to move the bananas around too much while they’re cooking – they need even heat and a bit of time to properly caramelize!